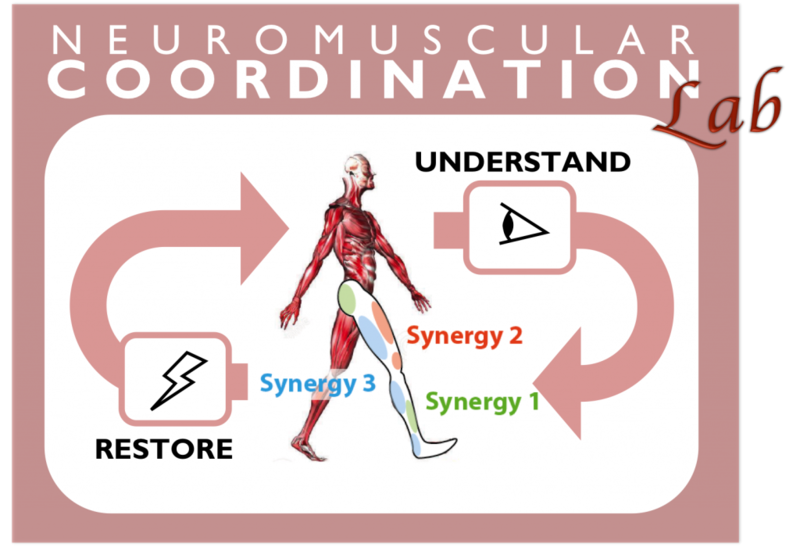 Neuromuscular coordination can be defined as the ability of the central nervous system (CNS) to control the muscles in the execution of multi-limb functional movements. The goal of our research is twofold. On the one side, we aim to gain better knowledge on the neural mechanisms at the basis of neuromuscular coordination and their biomechanical effects, in healthy and pathologic people. On the other side, we aim to apply this knowledge to neuro-rehabilitation, and create new assessment and therapeutic devices specifically aimed to restore functional neuromuscular coordination. • How is neuromuscular coordination related to functional performance? • How is neuromuscular coordination affected in pathology? • How does neuromuscular coordination change during learning of new tasks? • How can neuromuscular coordination be assessed reliably in clinical settings? • How can neuromuscular coordination be restored by external devices? Our experimental methodology is based on i) the analysis of physiological and biomechanical properties of the human musculoskeletal system, through electromyography and motion analysis system; and ii) the development of intervention devices based on wearable robotics, electrostimulation, and sensory biofeedback. The motor functions addressed by our research are related to lower limb movements, namely posture, pedaling and walking. The pathologies considered in our investigation are prevalently neurological, such as stroke, spinal cord injury and cerebral palsy. We are also interested in non-neurological impairments affecting the musculoskeletal system, and how these affect neuromuscular coordination. Diego Torricelli, Jose Gonzalez, Maarten Weckx, René Jiménez-Fabián, Bram Vanderborght, Massimo Sartori, Strahinja Dosen, Dario Farina, Dirk Lefeber, José L. Pons. Human-like compliant locomotion: State of the art of robotic implementations. Bioinspiration & Biomimetics 11. 1-20. 2016. S. Piazza, J. Gómez-Soriano, E. Bravo-Esteban, D. Torricelli, G. Avila-Martin, I. Galan-Arriero, J. L. Pons, and J. Taylor, “Maintenance of cutaneomuscular neuronal excitability after leg-cycling predicts lower limb muscle strength after incomplete spinal cord injury,” Clin. Neurophysiol., vol. 127, no. 6, pp. 2402–2409, 2016. A. de Los Reyes-Guzmán, I. Dimbwadyo-Terrer, S. Pérez-Nombela, F. Monasterio-Huelin, D. Torricelli, J. L. Pons, and A. Gil-Agudo, “Novel kinematic indices for quantifying movement agility and smoothness after cervical Spinal Cord Injury.,” NeuroRehabilitation, vol. 38, no. 2, pp. 199–209, Feb. 2016. F. O. Barroso, D. Torricelli, E. Bravo-Esteban, J. Taylor, J. Gómez-Soriano, C. Santos, J. C. Moreno, and J. L. Pons, “Muscle synergies in cycling after incomplete spinal cord injury: correlation with clinical measures of motor function and spasticity,” Front. Hum. Neurosci., vol. 9, no. 706, 2015. D. Torricelli, F. Barroso, M. Coscia, C. Alessandro, F. Lunardini, E. Bravo Esteban, and A. D’Avella, “Muscle Synergies in Clinical Practice: Theoretical and Practical Implications,” in JL Pons, R Raya, JE Gonzalez (Eds), Emerging Therapies in Rehabilitation II, Biosystems & Biorobotics, vol. 10, Springer, 2015, pp. 251–272. J. Gonzalez-Vargas, M. Sartori, S. Dosen, D. Torricelli, J. L. Pons, and D. Farina, “A predictive model of muscle excitations based on muscle modularity for a large repertoire of human locomotion conditions,” vol. 9, no. September, pp. 1–14, 2015. D. Torricelli, J. Gonzalez-Vargas, K. Mombaur, N. Tsagarakis, J. C. Moreno, and J. L. Pons, “Benchmarking Bipedal Locomotion. A Unified Scheme for Humanoids, Wearable Robots, and Humans,” IEEE Robot. Autom. Mag., no. September, pp. 103–115, 2015. F. O. Barroso, D. Torricelli, J. C. Moreno, J. Taylor, J. Gomez-Soriano, E. Bravo-Esteban, S. Piazza, C. Santos, and J. L Pons, “Shared muscle synergies in human walking and cycling.,” J. Neurophysiol., p. jn.00220.2014–, Jul. 2014. A. de los Reyes-Guzmán, I. Dimbwadyo-Terrer, F. Trincado-Alonso, F. Monasterio-Huelin, D. Torricelli, and A. Gil-Agudo, “Quantitative assessment based on kinematic measures of functional impairments during upper extremity movements: A review.,” Clin. Biomech. (Bristol, Avon), vol. 29, no. 7, pp. 719–27, Aug. 2014. E. Bravo-Esteban, J. Taylor, M. Aleixandre, C. Simon-Martínez, D. Torricelli, J. L. Pons, and J. Gómez-Soriano, “Tibialis Anterior muscle coherence during controlled voluntary activation in patients with spinal cord injury: diagnostic potential for muscle strength, gait and spasticity.,” J. Neuroeng. Rehabil., vol. 11, p. 23, 2014. D. Galeano, F. Brunetti, D. Torricelli, S. Piazza, and J. L. Pons, “A tool for balance control training using muscle synergies and multimodal interfaces,” Biomed Res. Int., vol. 2014, p. 565370, Jan. 2014. J. L. Pons, J. C. Moreno, D. Torricelli, and J. S. Taylor, “Principles of human locomotion: A review.,” Conf. Proc. IEEE Eng. Med. Biol. Soc., vol. 2013, pp. 6941–4, Jul. 2013. J. L. Pons and D. Torricelli, Emerging Therapies in Neurorehabilitation. Springer Science & Business Media, 2013. E. Bravo-Esteban, J. Taylor, J. Abián-Vicén, S. Albu, C. Simón-Martínez, D. Torricelli, and J. Gómez-Soriano, “Impact of specific symptoms of spasticity on voluntary lower limb muscle function, gait and daily activities during subacute and chronic spinal cord injury,” NeuroRehabilitation, vol. 33, pp. 531–543, 2013. D. Torricelli, M. Aleixandre, I. M. Alguacil Diego, R. Cano De La Cuerda, F. Molina Rueda, M. Carratala Tejada, S. Piazza, and J. L. Pons, “Modular control of mediolateral postural sway.,” Conf. Proc. IEEE Eng. Med. Biol. Soc., vol. 2012, pp. 3632–5, Jan. 2012. S. Piazza, D. Torricelli, F. Brunetti, a J. del-Ama, a Gil-Agudo, and J. L. Pons, “A novel FES control paradigm based on muscle synergies for postural rehabilitation therapy with hybrid exoskeletons.,” Conf. Proc. IEEE Eng. Med. Biol. Soc., vol. 2012, pp. 1868–71, Jan. 2012. Copyright © 2019 Neural Rehabilitation Group – CSIC.